A man accused of stabbing another man twice in the neck claims he only acted as a “Good Samaritan”, the High Court heard today. 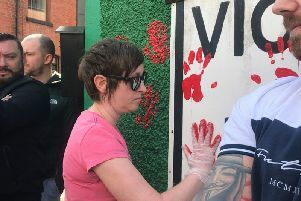 Paul Rice has been wrongly blamed after he phoned police to report the knifing outside flats on Carrigart Avenue, west Belfast, his lawyer argued. But prosecutors claimed the 32-year-old carried out the unprovoked attack last week which led to the victim going into cardiac arrest en route to hospital. Rice, originally from Dublin but with an address at Gortnamona View in Belfast, faces charges of causing grievous bodily harm with intent, disorderly behaviour and assault on police. Bail was refused due to the risk of re-offending. Police called to the scene in the early hours of October 12 found the victim standing in the road bleeding heavily from two wounds to the neck. He was given first aid and claimed to have been stabbed by a man with a southern Irish or Dublin accent called Peter or Paul while they waited outside a property, the court heard. Crown lawyer Kate McKay said Rice started shouting and swearing at officers when they encountered him nearby, squaring up to one constable and threatening to break his jaw. Despite the injured party suffering a cardiac arrest, he was later able to provide a statement. “He said it was a totally unprovoked attack by this man he knew only as Paul, believed to be this applicant,” Mrs McKay said. His throat was cut with a blade he had not previously seen, according to his account. “Immediately after the assault he ran to neighbouring houses, banging on several doors seeking assistance,” the prosecutor added. The victim sustained wounds measuring 2cm and 1cm on either side of his neck, but is now out of hospital. Police have not yet recovered any suspected weapon. During interviews Rice denied any involvement in the attack. He claimed a stranger approached and stabbed the victim while they sat outside a flat they had been in earlier that night. Defence counsel Declan Quinn argued Rice was the one who phoned police and waited for them to arrive. “He was extremely frustrated when police arrived, he seemed to be in the frame for matters about which he says he was acting as a Good Samaritan,” the barrister submitted. Mr Justice Horner said ongoing forensic inquiries may help the case.